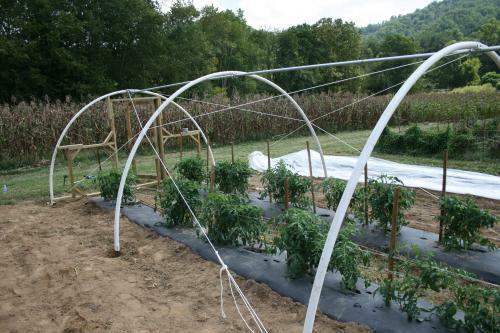 High tunnels can be constructed from a variety of materials. Research materials thoroughly to make sure that the structure and covering best suit the budget for and purpose of the high tunnel. When possible, use materials with lowest environmental impact. Metal pipe is the strongest and most durable framing material for rib construction. Metal pipe ranges in quality, from electrical conduit (the weakest) to Schedule 80 water pipe (the strongest). Schedule 40 (3/4 inch galvanized water pipe) is commonly used, but it is 20% weaker than Schedule 80 pipe. Metal ribs are very strong but also heavy and more difficult to maneuver. Metal pipe is also used to construct endwalls. PVC (polyvinylchloride) pipe is an inexpensive but relatively weak material for rib construction. PVC is lightweight and easy to maneuver. However, high tunnels made from plastic hoops are vulnerable to wind and snow load collapse. PVC expands and contracts with temperature and deteriorates over time. There are human health concerns related to PVC manufacture and disposal (Altshyler et al., 2007). Wood is not typically used for rib construction, but it is often a component of end walls, hip boards, and baseboards. To be compliant with organic certification standards, lumber treated with a prohibited substance cannot be used in any new installation or replacement structure if it comes in contact with the soil, crop, or livestock. Due to its impact on human and animal health, CCA (chromated copper arsenate) pressure- treated wood is no longer legal for residential and general consumer uses in the United States. Alternatives to lumber treated with prohibited materials such as CCA include untreated wood, wood treated with a compliant substance, steel, materials made from recycled plastics, cement board panels, concrete blocks, stone, brick, and concrete. Organic farmers can use naturally rot-resistant woods such as cedar, cypress, black locust, Osage Orange, and white oak. Borate materials are commercially available arsenic-free wood treatments which have been used for years to protect wood against insect pests and decay. Boric acid is a synthetic substance allowed for use on organic farms for “structural pest control, [not in] direct contact with organic food or crops” [NOP section 205.601(e)(2)]. Borates have low acute toxicity and do not cause cancer (Quarles 1998 and 2002). Borates or other treatments can be used to treat naturally resistant wood, further extending its useful life. For more complete information on potential alternatives to treated lumber, see the ATTRA publication “Organic alternatives to treated lumber” and Quarles (1998 and 2002). BE AWARE that many of the alternative lumber treatments described in the ATTRA article are NOT currently allowed for use on organic farms. For more information see the article Can I Use This Input on my Organic Farm?. Greenhouse grade polyethylene, a plastic film, is the most common material used for covering high tunnels. Polyethylene is sold by thickness in mils (1 mil = 1/1000 of an inch) and it is rated for longevity in years. Typical specifications for a high tunnel covering would be a single layer of greenhouse grade 6 mil polyethylene rated for 5 years. Traditional permanent greenhouses usually have two layers of polyethylene, separated by air blown between the layers, to reduce heat loss during cold season production. Polyethylene films are recyclable. Some polyethylene glazing films contain additives designed to enhance durability and performance, but these also increase cost and reduce light transmission. Ultra-Violet (UV) stabilizing additives block UV light to slow degradation and hardening of plastic. Never purchase construction-grade plastic because it does not contain a UV-inhibitor and will only last one growing season. Anti-fog surfactants make water condensing on poly films sheet run down to the sides of the structure, rather than bead and drop on the foliage of plants below. Condensation on plastic is undesirable because it decreases light intensity, and condensation dripping on plant foliage encourages foliar disease development. Shade cloth is made from knitted polyethylene strands or woven polyester and is water permeable. Shade cloth is used to reduce light intensity, temperature, and plant exposure to wind. 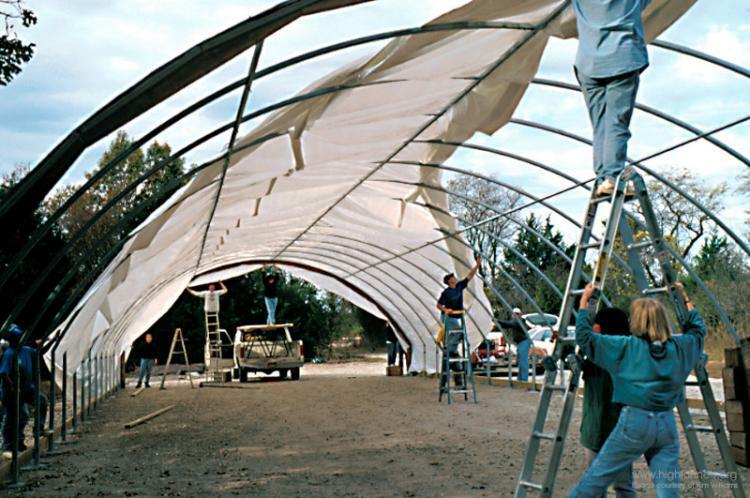 Shade cloth is often used in combination with plastic covering, but in some applications in warm climates, or during the summer, it can be used as the sole covering for a high tunnel. Black, white and various shades of green and brown are available. Shade cloth is rated by the percent of light blocked, varying from 20-90%. Seasonal and crop species requirements dictate which percent shade cloth should be used. Row and bed covers are lightweight, water- and air-permeable blankets typically made of spunbonded polypropylene. Row covers can be used as the sole cover on a high tunnel, or as an additional material applied over crops growing inside high tunnels. Row covers can protect crops from wind and pests and increase air and soil temperatures. Altshyler, K., S. Horst, N. Malin, G. Norris and Y. Nishioka. 2007. Assessment of the technical basis for a PVC-related materials credit for LEED [Online]. US Green Building Council. Available at: http://www.usgbc.org/Docs/LEED_tsac/USGBC_TSAC_PVC_Draft_Report_12-17-04..pdf (verified 4 April 2011). Blomgren, T., T. Frisch, and S. Moore. Undated. High tunnels: using low-cost technology to increase yields, improve quality, and extend the season. University of Vermont Center for Sustainable Agriculture. (Available as download or for purchase as video and manual at: http://www.uvm.edu/vtvegandberry/Videos/hightunnelvideo.html) (verified 4 April 2011). Includes organic-specific information, including organic farm case studies, and a good materials review. Gegner, L. 2002. Organic alternatives to treated lumber [Online]. ATTRA Publication CT1. This publication is currently in revision. For more information, see http://attra.ncat.org/publication.html (verified 4 April 2011). Quarles, W. 1998. Borates for wood protection. The IPM Practitioner 20 (3) 1–12. Quarles, W. 2002. Alternatives to arsenic-treated wood. Common Sense Pest Control Winter:13–22. Raviv, M and Y. Antignus, 2004. UV radiation effects on pathogens and insect pests of greenhouse-grown crops. Phytochemistry and Photobiology March 2004. (Available online at: http://findarticles.com/p/articles/mi_qa3931/is_200403/ai_n9406856/pg_1?tag=artBody;col1 ) (verified 4 April 2011). Runkle, E., 2008. Installing infrared polyethylene film to save energy [Online]. Greenhouse Product News 8(7). Available at: http://hrt.msu.edu/Energy/Notebook/pdf/Sec3/Installing_IR_Film_by_Runkle.pdf (verified 4 April 2011).